the western portion in which the animals are largely of Asian origin, and an eastern portion which reflects Australasia. And develop his own theories on evolution and the survival of the fittest. Probably influenced by the hardship and danger of his expeditions, it might seem. Besides being a co-founder of evolution, Wallace is also considered the Father of Biogeography, the study of the distribution of species across the earth and through time. Among Wallace's many other contributions to evolutionary theory is the Wallace Effect, or how natural selection might drive speciation by encouraging the development of barriers against hybridization. Unlike the independent and socially connected Darwin, Wallace came from a modest middle-class background and supported his scientific work through his writings and the sale of specimens to collectors. In fact, the many specimens he collected during his four years in the Amazon River Basin were intended to fund his research. Disastrously, all was lost on the way to England when his ship caught fire and sank. Fortunately, Wallace was rescued after ten days adrift but his dreams were dashed. For the moment. Seemingly undeterred, he simply regrouped and headed off to the Malay Archipelago. His famous paper on natural selection, jointly presented before the Linnean Society of London with a paper by Charles Darwin in 1858, encouraged Darwin to overcome his hesitations to publish On the Origin of Species. 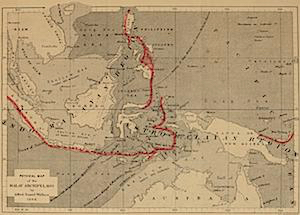 Darwin enjoyed a comfortable life in England which he never again left for parts unknown after his early voyage abroad the Beagle. Having originally been intent on the country clergy, he was only too aware of the fuss that the publication of his theories would cause. Wallace, in contrast, seemed intent on adventure. 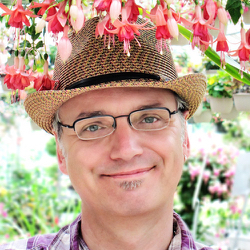 Further in his critique, Wallace presses the fashionable fuchsia of English gardens into service, seeing it an illustration of evolutionary forces working close at hand. "When fashion demands any particular change in the form, or size, or colour of a flower, sufficient variation always occurs in the right direction, as is shown by our roses, auriculas, and geraniums; when, as recently, ornamental leaves come into fashion sufficient variation is found to meet the demand, and we have zoned pelargoniums and variegated ivy, and it is discovered that a host of our commonest shrubs and herbaceous plants have taken to vary in this direction just when we want them to do so! This rapid variation is not confined to old and well-known plants subjected for a long series of generations to cultivation, but the Sikhim Rhododendrons, the Fuchsias and Calceolarias from the Andes, and the Pelargoniums from the Cape are equally accommodating, and vary just when and where and how we require them." Today is the 100th anniversary of Wallace’s death. Notes: 1. Wallace. Island life: or, the phenomena and causes of insular faunas and floras (1892); 2. Wallace. “Creation by Law”, Quarterly Journal of Science 4 (16), pp. 471-488 (1867). Illustrations: 1. 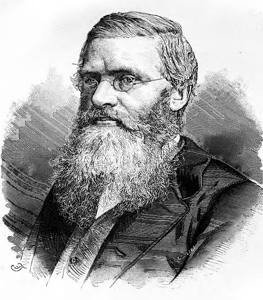 Wallace’s portrait from his book, Natural Selection (1878); 2. 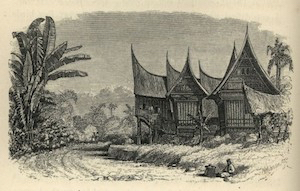 “Chief’s house and rice shed in a Sumatran Village”. Wallace. The Malay Archipelego (1869); 3. 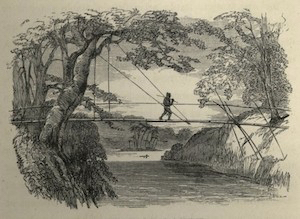 “Dyak crossing a bamboo bridge”. Wallace. The Malay Archipelego (1869); 4. 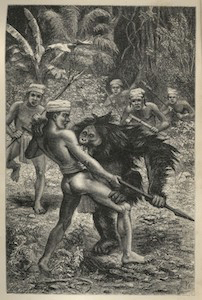 “Orang Utan attacked by Dyaks”. Wallace. The Malay Archipelego (1869); 5. Map of the Wallace Line running through the Indonesian archipelago dividing Asian and Australasian fauna. Wallace. The Malay Archipelego (1869); 6. 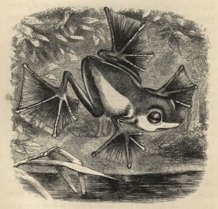 Wallace's flying frog, Rhacophorus nigropalmatus, first collected by Wallace and named for him. 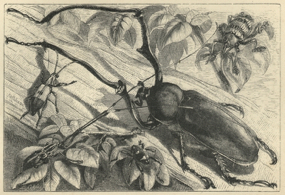 Illustrated in Wallace's The Malay Archipelago (1869); 7. Four brightly colored members of the Papillo genus. Wallace. 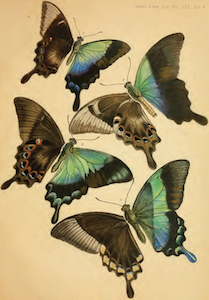 “On the Phenomena of Variation and Geographical Distribution as illustrated by the Papilionidæ of the Malayan Region”, Transactions of the Linnean Society, Vol. XXV, Tab. 6 (1864); 8.. George Robert Gary. 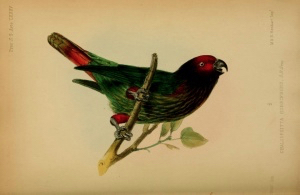 “A List of birds with descriptions of new species obtained by Mr. Alfred R. Wallace in the Aru and Ké Islands”, Proceedings of the Zoological Society of London, 26 (1858); 9. 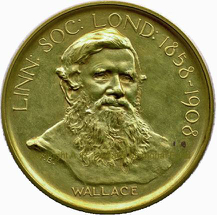 The Wallace face of the Wallace-Darwin medal first awarded by the Linnean Society of London in 1908 on the fiftieth anniversary of the joint presentation of their seminal papers on natural selection; 10. 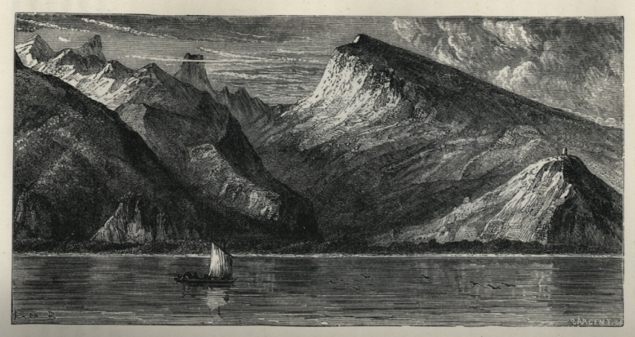 “View on the shore of Tahiti” from Australasia, p. 509 (1879) 11. Five Moluccan beetles, including three new species. Wallace. The Malay Archipelego (1869).